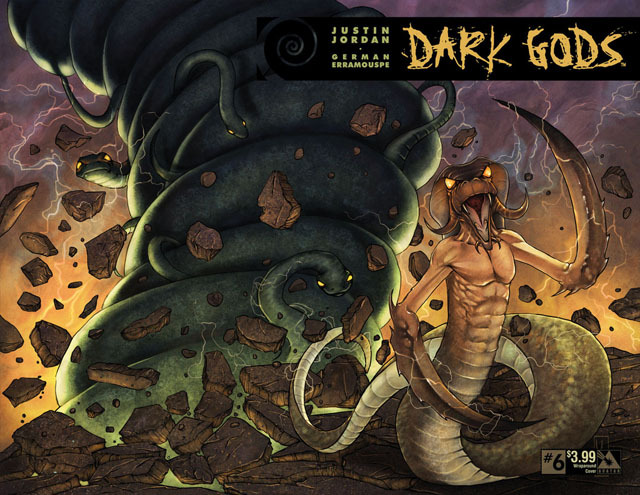 DARK GODS #6 Review | Warped Factor - Words in the Key of Geek. After the last issue I had no idea where this was going. Murdock, the man who seemed to be the hero, wasn’t! He was raising the Old Gods. 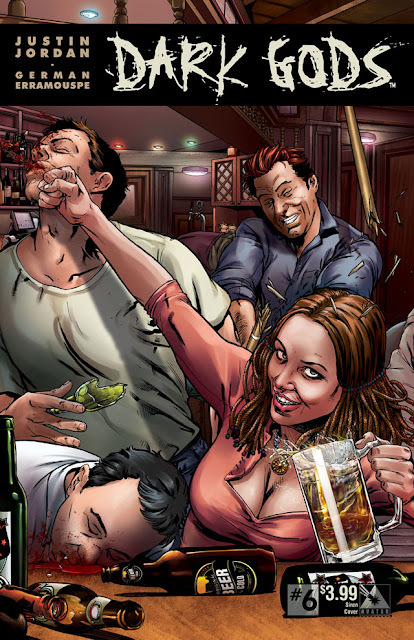 Now Joshua and Marion are caught in the middle of a major battlefield. Marion is clearly stunned by all that’s gone on, by Murdock’s betrayal, and who wouldn’t be? But with bodies, blood and guts all around them, what’s to do? Well Joshua is a smart cookie, he does what any self-respecting modern guy would do - he streams it to the masses off his mobile phone. Seemed like a sad indictment of modern culture to me, but only for a few seconds. As the video goes viral - given the speed and strength of the connection needed to do this, this might actually be the most unrealistic part of the whole comic. We see into the past. In the beginning there was Murdoch, the cave man who sees the light, understands the order in chaos, gains its power, becomes the embodiment of the “things without shape or description”. But he is not the only God to rise, and as they move through the ages, we see the many forms these rivals take on, including a less than Chris-Hemsworth-handsome Thor. Still you can’t have everything. Stepping back to the present, Joshua finds the talking head, and with it and Marion they reveal their incredible plan. As events unfold this plan… well read it and see, it’s brilliant! This issue really delivers. The story is clever and well written, unexpected and enjoyable. The pace is good and once I started reading, I couldn’t put it down. The drawing is incredible, love the way that you get noticeably different styles for alternative sections of the story. The colouring and shading on Murdoch’s physique in the “history” sections is beautiful. I’m not that keen on the rougher style of drawing for the fight scenes, but it really fits the mood of those moments. So, good story, good drawing, great read. Now it’s a toughy to score this one. I want to top it, but the comic losses a part of a point for the artwork I don’t like, but that really is a personal opinion, as the art suits the story. On the other hand, my scoring levels are a personal opinion, this is a four out of five, but such a high one, if I was a more mellowed-out type, I know it would be a five, but I’m not! I’m like that teacher no one wants - you want top marks, give me perfection. Think of it as a 4.8 if you must.